The new ST51A Biogas Flow Meter from Fluid Components International (FCI) is for engineers responsible for biogas production involving industrial organic waste and municipal wastewater treatment. This potent mixture of combustible methane (CH4), carbon dioxide (CO2), water and trace levels of corrosive hydrogen sulfide (H2S) is problematic for many flow measuring technologies. The combustible properties of CH4 gas require HazEx safety approvals. In addition the corrosive, sticky nature of the H2S particles affects the performance and can clog many flow sensors, leading to frequent, labour-intensive cleanings. FCI’s thermal mass ST51A Biogas Flow Meter is designed specifically for dirty, potentially hazardous biogas processes. It provides system operators with highly accurate and repeatable mass flow measurement to facilitate system control, log gas production data and provide mandated safety and environmental reporting information. To survive in biogas processes, the ST51 Flow Meter comes standard with 316 stainless steel body construction and Hastelloy-C22 thermal sensors. It features a no moving parts, non-clogging design, which eliminates the need for constant cleaning under wet, dirty biogas conditions. The ST51A meter comes with full global Division 1, Zone 1, Ex safety approvals. The model ST51A adds digital communications via the HART, Version 7 protocol. It provides plant staff with digital data on flow rate and temperature parameters, the instrument’s health, fault diagnostics and asset management info. It also features the capability to make field configuration changes if needed by using standard HART portable communicators. 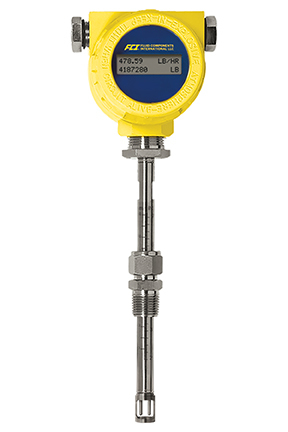 This insertion-style flow meter is available in multiple probe lengths for installation into pipe diameters from 2.5 to 24 inches (63 to 610 mm). It is easily connected into the pipe via a 1/2 inch or 3/4 inch NPT compression fitting. Its insertion-style design requires only a simple, single point tap into the process piping that requires minimal technician time.